English phone service providers Vodafone, who recently signalled their intention of expanding their presence in the German telecommunications market through the €7.7b purchase of Kabel Deutschland Holding, have also reached out to offer more TV content to smartphone and tablet computer customers, after announcing a deal with popular satellite TV providers Sky Deutschland. People who use ‘Vodafone Germany’s internet TV services will as of August, be able to access Sky programming such as live fixtures from the Bundesliga football league, as well as popular series such as imported HBO fantasy-drama Game of Thrones. The IPTV partnership is claimed by Sky as including all channels of ‘Sky Welt’, ‘Sky Film’, ‘Sky Sports’, and premium HD channels from the provider, along with a number of ‘joint marketing activities’ throughout the duration of the contract. 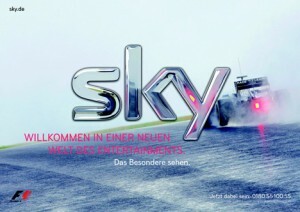 Joining their subsidiary Kabel Deutschland in offering Sky Deutschland content, Vodafone Germany will be looking to place a strong foothold in the mobile content industry in the country, but will they be able to put their own stamp on a wide range of programming that carries the name of one company?